Finely chop mint, and rub into sugar OR pulse mint and sugar in food processor. Place mint sugar in 1-quart saucepan with raspberries and 1/4 cup water. Heat over medium-high heat until sugar dissolves, raspberries break down, and mixture comes to a boil. Remove from heat, and strain through fine mesh strainer. Set raspberry mint syrup aside to cool. 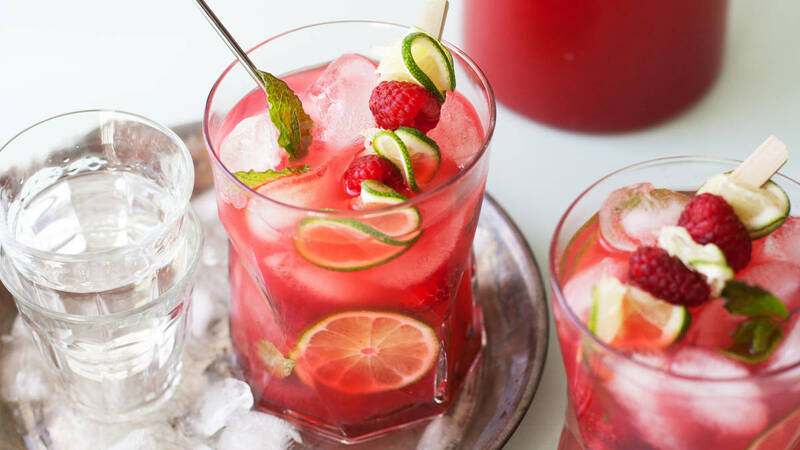 In large pitcher, mix raspberry mint syrup, lime juice, 3 cups water and the sparkling water. Serve immediately with lots of ice and a shot of gin, or refrigerate until ready to serve. Use the syrup to taste, scaling up or down, depending on how tart you like your limeade. For a full adult version, add the alcohol straight to the pitcher of limeade. To keep it family friendly, serve shots on the side, and add to each drink as needed. Pulsing or rubbing the mint into the sugar releases essential oils and makes the syrup that much more minty.